On page 223 Arturo was sitting in class thinking about baseball while “phony little applepolising” Agnes Hobson was reading aloud from Sir Walter Scott’s Lady of the Lake. Sir Walter Scott, 1st Baronet (August 15, 1771 – 21 September 21, 1832) was a prolific Scottish historical novelist and poet popular throughout Europe during his time. In some ways Scott was the first author to have a truly international career in his lifetime, with many contemporary readers all over Europe, Australia, and North America. Born in College Wynd in the Old Town of Edinburgh in 1771, the son of a solicitor, the young Walter Scott survived a childhood bout of polio in 1773 that would leave him lame in his right leg for the rest of his life. To restore his health he was sent in that year to live in the rural Borders region at his grandparents' farm at Sandyknowe, adjacent to the ruin of Smailholm Tower, the earlier family home. Here he was taught to read by his aunt Jenny, and learned from her the speech patterns and many of the tales and legends which characterized much of his work. In January 1775 he returned to Edinburgh, and that summer went with his aunt Jenny to take spa treatment at Bath in England. In the winter of 1776 he went back to Sandyknowe, with another attempt at a water cure being made at Prestonpans during the following summer. Scott began studying classics at the University of Edinburgh in November 1783, at the age of only twelve so that he was a year or so younger than most of his fellow students. In March 1786 he began an apprenticeship in his father's office, to become a Writer to the Signet. When it was decided that he would become a lawyer he returned to the university to study law, first taking classes in Moral Philosophy and Universal History in 1789-90. After completing his studies in law, he became a lawyer in Edinburgh. As a lawyer's clerk he made his first visit to the Scottish Highlands directing an eviction. He was admitted to the Faculty of Advocates in 1792. Scott then became an ardent volunteer in the yeomanry and on one of his "raids" he met at Gilsland Spa Margaret Charlotte Charpentier, daughter of Jean Charpentier of Lyon in France, whom he married in 1797. They had five children. In 1799 he was appointed Sheriff-Deputy of the County of Selkirk, based in the Royal Burgh of Selkirk. "Our wishes for riches are seldom satisfied by possessing more than we can use, enjoy or bequeath," Walter Scott once wrote in his journal. However, like much of Scott's life, this comment displays a contradiction between his life and his words, between the intellect and the heart. In reality, Scott--made a baronet in 1818 and thereafter known as Sir Walter Scott--had wishes that far exceeded personal use. After becoming a successful poet with publication of the fabulously popular The Lay of the Last Minstrel and Lady of the Lake, Scott purchased an estate on the banks of the Tweed which he called Abbotsford, and proceeded to build a fake medieval castle, complete with turrets, but also with such modern conveniences as toilets and gas lighting. He planted 500 acres of this domain with mature oaks to give it the appearance of age, and took up the life of the landed country gentry. Yet Scott was no more of the gentry than his ersatz castle, and he poured so much money into its building that when financial difficulties later arose, he would have to spend the rest of his life paying off debt, turning out book after book in the effort. Scott continued to be fascinated with the lore and lure of bygone ages up unto his death in 1832. All his works are imbued with this antiquarian passion; indeed he single-handedly created the genre of historical fiction, bringing to vivid life not only Scottish history, but English as well (Ivanhoe). 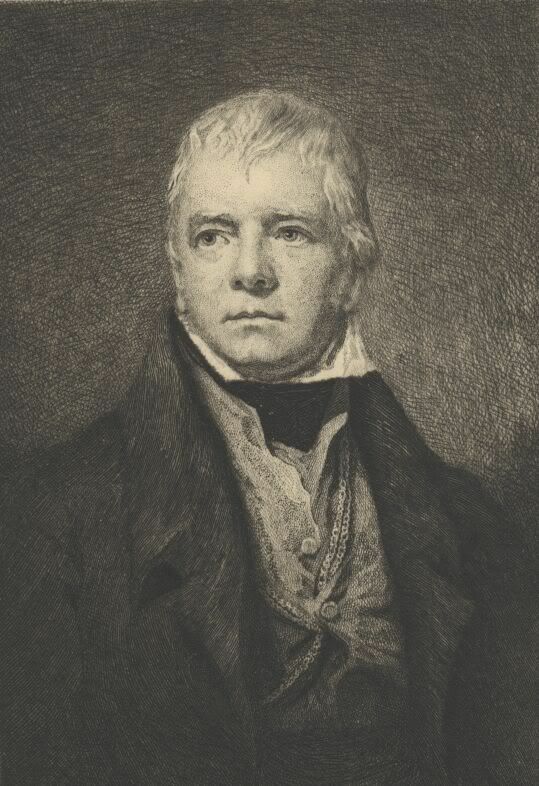 In his Scottish novels such as Waverley, The Heart of Mid-Lothian, Rob Roy, The Bride of Lammermoor, and The Pirate, Walter Scott displayed on paper the dichotomy at work in his own life: "the regret for the old days when Scotland was an independent but turbulent and distracted country," as the critic David Daiches put it in his Literary Essays, coupled with a "satisfaction at the peace, prosperity and progress which he felt had been assured by the Union with England in 1707 and the successful establishment of the Hanoverian dynasty on the British throne." In short, Scott wrote of medieval castles with modern plumbing. Always present in his work is the tension between the benefits of civilization and the sacrifice of heroic and chivalric values of another age which had to be made to attain such progress. Though Scott was, according to Gary Kelly in the Concise Dictionary of British Literary Biography, "the most influential novelist in world literature," he paid dearly for such personal progress. After Scott had founded a printing press, his poetry, beginning with The Lay of the Last Minstrel in 1805, brought him fame. Scott followed up this success with the poem Marmion, and a measure of his instant popularity was the fact that he was paid one thousand pounds for it--a sizeable sum in 1808--by the publisher Archibald Constable. Scott had established himself as a best-selling author in short order and was quickly becoming known for his political views, as well. His conservative Tory opinions were being disseminated in the Quarterly Review, which he helped to found. But he was no simple stodgy man of letters; he blended social and political conservatism with a progressive agenda. He saw the costs of progress, but championed it nonetheless. The Lady of the Lake taking the infant Lancelot. From Tennyson's Idylls of the King. In 1810 Scott published The Lady of the Lake, yet another best-selling poem, set in the Scottish Highlands. It concerns the adventures of the hero James Fitz-James, the villainous hero Roderick Dhu, and the love interest Ellen Douglas. Something of an Arthurian romance (see the legend of Lancelot and the Lady of the Lake below) transposed to the Highlands, the poem narrates the attempts of Fitz-James to establish a Scottish kingdom and the ensuing conflict with the Dhu clan in this effort. 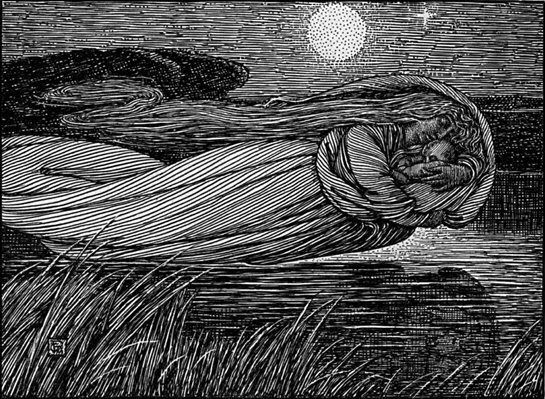 It is generally regarded as his most accomplished poem in terms of plot, and though seven further verse narratives were to follow over the years, none gained such wide popularity as The Lady of the Lake and the two preceding it. While some contemporary reviewers, including Jeffrey, applauded Scott for his ability to reach such a wide readership, others, including the English poet Samuel Taylor Coleridge, thought the poem tedious and "endless," as Coleridge wrote to William Wordsworth. "I never remember a narrative poem in which I felt the sense of progress so languid." Portions of the German translation of this work were later set to music by Franz Schubert. One of these songs, Ellens dritter Gesang, is popularly labeled as "Schubert's Ave Maria". In La Donna del Lago, Scott's poem material furnished subject matter for an opera by Gioacchino Rossini (Naples 1819). It was the first of a fashion for operas with Scottish settings and based on Scott's works, of which Donizetti's Lucia di Lammermoor is the most familiar. Lancelot is the son of King Ban of Brittany, but when he is a child, the fairy Vivienne, known as the Lady of the Lake, steals him. After Lancelot reaches manhood, the Lady of the Lake takes him to Arthur’s court, where he becomes a knight. Lancelot and Queen Guinevere fall in love, and while under the spell of a potion, Lancelot lies with the lady Elaine, thinking that she is Guinevere. Elaine bears a son, Galahad. Arthur discovers Lancelot and Guinevere’s love affair when Agravain, brother of the knight Gawain, reveals it. Arthur’s system of justice then demands that he condemn Guinevere to death. Lancelot escapes with Guinevere to his own castle. Arthur and Gawain lay siege, forcing Lancelot to return the queen and flee. Arthur and Gawain then pursue Lancelot to Brittany. During the king's absence, his illegitimate son Mordred seizes the kingdom and attempts to marry Guinevere. Arthur then returns and drives Mordred back into the west of England. In their final battle on Salisbury Plain, Arthur kills Mordred but is grievously wounded and is taken away to the island of Avalon. Lancelot then returns to England, but after finding that Guinevere has withdrawn to an abbey, he himself takes religious vows and has visions confirming his destiny in heaven. Lancelot and Elaine’s son, Galahad, eventually completes the quest for the Holy Grail, the sacred cup used by Jesus Christ at the Last Supper. Great tidbit, Liz! From the birth of pulp fiction to the man whose writing started the historical fiction genre ~ very cool!! The beginning of the story of Sir Walter Scott, and his nostalgia for earlier times, reminded me Captain Jack's line in AWE: "The world's the same, there's just less in it." The Lady of Lake myth is one of my favorite stories! (Have we got any fans of The Mists of Avalon here?) When I was in England in January, we visited West Sussex and the town of Arundel, with its classic Norman Castle, where the legend seemed so alive to me! We were talking about The Lady of the Lake whilst in one of the pubs outside of town, and the innkeeper overheard us and offered to give us the secret scoop on how/where to find the Lake! As you might expect, the directions had us go 'down a long, dark, lonely road' til we got to a certain 'ancient oak tree' (think SH) then turn and go to road's end. Sure enough, there it was!! Well, it was a lake anyway, and in the drizzling rain and gloomy overcast skies, it looked like it could have been (and still was) the home to many spirits, included The Lady. Anyway, now I want to read Scott's poem, The Pirate! Thanks again for a memorable tidbit! Although there are lovely passages in that, can't you just hear phony little Agnes singsonging her way through those endless verses? No wonder Arturo thought of baseball. Very interesting Liz. I didn't know Sir Walter Scott had polio. Our reading tidbits keep touching my genealogy. Sir Walter Scott popularized historical novels including history that included my Mothers Scottish ancestors. I did find W.H. Murray's Rob Roy a bit kinder than Scotts. The Lady of the Lake and all the Lancelot, King Arthur stories seem to be ageless. Every generation falls in love with King Arthur. I remember reading The Hollow Hills by Mary Stewart years ago and it made such an impression on me that I have read everything I could about Merlin, and King Arthur ever since. Only our tidbits can get from Bandini to King Arthur. Parlez wrote: When I was in England in January, we visited West Sussex and the town of Arundel, with its classic Norman Castle, where the legend seemed so alive to me! We were talking about The Lady of the Lake whilst in one of the pubs outside of town, and the innkeeper overheard us and offered to give us the secret scoop on how/where to find the Lake! As you might expect, the directions had us go 'down a long, dark, lonely road' til we got to a certain 'ancient oak tree' (think SH) then turn and go to road's end. Sure enough, there it was!! Well, it was a lake anyway, and in the drizzling rain and gloomy overcast skies, it looked like it could have been (and still was) the home to many spirits, included The Lady. Parlez, I would be afraid to go down that road. I would be thinking of the Loch Ness Monster. Gemini wrote: Only our tidbits can get from Bandini to King Arthur. Gemini, sometimes I think I live in the Twilight Zone. And in regards to genealogy, I found out today when visiting with my long lost cousins that my dad’s side of the family really originated in France, not Scotland. Fansmom, it’s not a poem, it’s a novel. Last edited by Liz on Thu Aug 30, 2007 1:13 pm, edited 1 time in total. Thanks for th tidbit, Liz! I love reading historical romances, so thank you Sir Walter! I remember reading The Hollow Hills by Mary Stewart years ago and it made such an impression on me that I have read everything I could about Merlin, and King Arthur ever since. When I was in England in January, we visited West Sussex and the town of Arundel, with its classic Norman Castle, where the legend seemed so alive to me! We were talking about The Lady of the Lake whilst in one of the pubs outside of town, and the innkeeper overheard us and offered to give us the secret scoop on how/where to find the Lake! As you might expect, the directions had us go 'down a long, dark, lonely road' til we got to a certain 'ancient oak tree' (think SH) then turn and go to road's end. Sure enough, there it was!! Well, it was a lake anyway, and in the drizzling rain and gloomy overcast skies, it looked like it could have been (and still was) the home to many spirits, included The Lady. l really enjoyed The Mists of Avalon. Parlez, you are a brave woman, that road sounds eerie. I think my mom lives in that Twilight Zone too. My parents have been married 65 years and the first 40 years my mom told everyone she married an Englishman then found out he was German after I got into genealogy. Linda Lee, I still have my old paperback copy of "The hollow hills". Its pages are a bit brown on the edges though. After all this talk about The lady of the lake and King Arthur, I might just read it again. Parlez, I would be afraid to go down that road. I would be thinking of the Lock Nest Monster. Well, I've had much more perilous adventures in my life than that one! And in keeping with your rich, Freudian spelling, Liz, I'd say that I decided a long time ago to take my chances facing the Monster of Loch Ness as opposed to the monsters lurking in a Locked Nest! And that truly was Freudian, because I knew how to spell Loch Ness. It was a long day, yesterday.